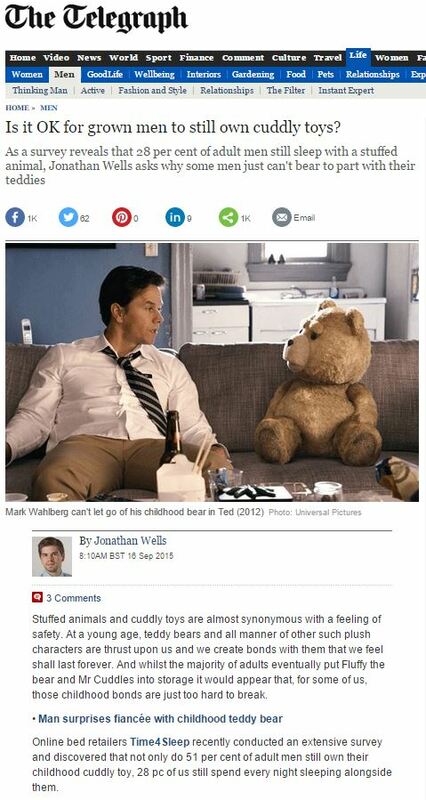 Cuddling up to a teddy bear is usual practise for small children and toddlers but increasing numbers of grown men are confessing to sleeping with a cuddly toy. Half of men still have a teddy bear, compared with 39 per cent of women and a quarter take their much-loved stuffed toy to bed at night, according to research commissioned by Time4Sleep. 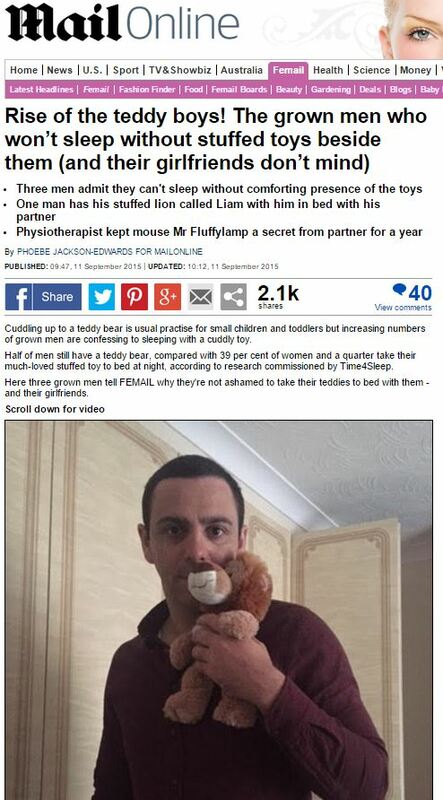 Here three grown men tell FEMAIL why they’re not ashamed to take their teddies to bed with them – and their girlfriends. Is it OK for grown men to still own cuddly toys? Stuffed animals and cuddly toys are almost synonymous with a feeling of safety. At a young age, teddy bears and all manner of other such plush characters are thrust upon us and we create bonds with them that we feel shall last forever. And whilst the majority of adults eventually put Fluffy the bear and Mr Cuddles into storage it would appear that, for some of us, those childhood bonds are just too hard to break. What’s the story here: are we seeing an epidemic of man-child proportions, with men around the country clinging onto their childhoods and their bedtime stuffed companion? Or are we seeing an orchestrated PR campaign from a bed retailer? Online bed retailers Time4Sleep recently conducted an extensive survey and discovered that not only do 51 per cent of adult men still own their childhood cuddly toy, 28 pc of us still spend every night sleeping alongside them. Was it ever in doubt? This entry was posted in Time4Sleep and tagged daily mail, Jaywing PR, Jonathan Warren, Jonathan Wells, Phoebe Jackson-Edwards, Robin Lawrence, Shackleton PR, telegraph, Time4Sleep on October 12, 2015 by Michael Marshall.